ooVoo Toolbar by Visicom Media Inc. - Boost Your PC. ooVoo Toolbar installs into the IE and Firefox web browsers and provides advertisier supported searchs that changes and redircts default search results as well as DNS errors. ooVoo Toolbar becomes the browser's default search provider which changes all search requests as well as tracks your Internet surfing behavior in order display targeted advertising. Download Boost and enjoy your PC. Remove ooVoo Toolbar from your PC. 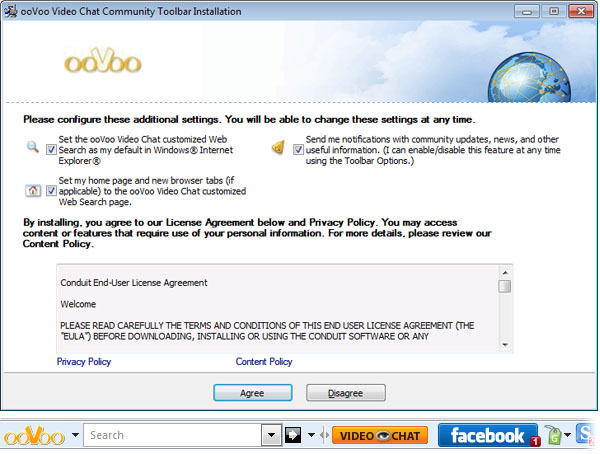 Why should I uninstall ooVoo Toolbar? Removing unwanted toolbars and other browser plugins is usually a good idea as they have the potential to cause web browser stability issues contributing to a slower PC performance. ooVoo Toolbar can monitor your search queries and browsing habits in order to send you targeted ads and modify your search settings and results. ooVoo Toolbar by Visicom Media Inc.
To the right of the list item, click the Uninstall button and Boost will completely remove ooVoo Toolbar from your PC. Use Add/Remove Programs control panel in Windows makes to uninstall ooVoo Toolbar. Follow the appropriate instructions below to use this control panel. Select ooVoo Toolbar from the list of programs, and click Uninstall. Alternatively, right-click the program and select Uninstall. Select ooVoo Toolbar from the program list, and click Uninstall. Alternatively, right-click the program and select Uninstall. Select ooVoo Toolbar from the list of programs and click Remove. Boost helps you remove ooVoo Toolbar by Visicom Media Inc. and clean your PC.